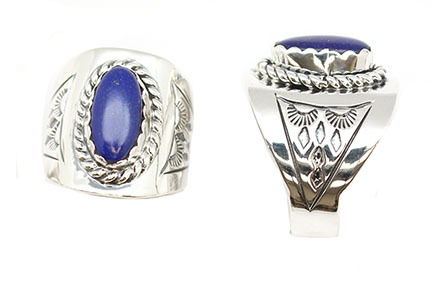 This sterling silver 7 x 14mm lapis men's ring has twist border around stone and stamped design on the sides of shank. Top of ring measures approximately 7/8" wide and tapers down. Handmade by Navajo artisan Harry Spencer and or David Morris. Choose size(s) when ordering. Stamping designs may vary.